"Hahaha!" bellowed the huge barbarian at the sight of the tiny, yet feisty imp. "You're a brave little thing, but I'm going to squash you with a single swing! And then, I might even eat you, though you smell terrible." Drinlarr swung his mighty axe as broadly as the slightly cramped chamber would allow (skill 4, dice roll of 5 = 9) catching the goblin off guard and dealing it a devastating blow (skill 4, dice roll of 1 = 5. Goblin takes 4 damage). The goblin slashed angrily back at the barbarian (strength 2, dice of 6 = 8), Drinlarr however has poised for the attack, parried the goblins blow and took one more swipe at the pesky imp with his axe (strength 5, dice roll of 6 = 11. Goblin takes 3 damage. No health remaining). The goblin fell down dead, it's boy rendered in two by the barbarians blow. "Ha! foolish mite!" scoffed Drinlarr, now on my way to the centre! Drinlarr's 2 magic points were unused (the goblin died before they were needed) so are returned to him. 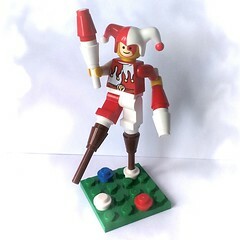 He receives 1 luck point for a successful conflict and 3 'gold' for submitting a 8x8 MOC before the deadline. Astrid was a seasoned warrior. She had seen many battles and many strange and mystical events during battles, but her current situation had her baffled. How had she arrived in this maze? And for what purpose? Her emerald eyes darted around the room, looking for any clues as to a means of escape. She chose the left door and entered another room very similar to the last. There was another door straight ahead, one to her right, and the door behind her that she had just entered through. Suddenly a creature lunged from the darkness and clawed at her face. It was an imp. Fenrir, please submit your points in the forum using a short story. 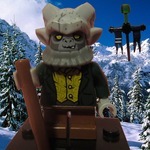 You may also include a small 8x8 MOC of the Astrid and the imp if you wish. Once you've done this I'll crunch the numbers and write up the result, then move on to the next player. Deadline - Saturday/Sunday. As the Imp began jumping around the room, its high-pitched screams unintelligible to the human ear, Astrid could now see what was attacking her and thrust her spear again and again as she tried to kill the little imp. Finally a well timed thrust caught the imp off-guard (skill 5, dice roll of 4 = 9) and the imp screamed in pain (skill 3, dice roll of 2 = 5. Imp takes 4 damage. 2 health remaining). The Imp suddenly disappeared in a puff of smoke, retreating into the shadows (magic 2, dice roll of 1 = 3). Astrid's emerald eyes peered into the darkness, perceiving things the average man could not. She paused, and then threw her spear into the shadows (magic 4, dice roll of 2 = 6). The imp shrieked, impaled on the spear, then died, crumbling to dust (Imp takes 3 damage. No health remaining). Astrid retrieved her spear, and then stood up straight. Her quest was only just beginning and three options lay ahead of her, she could continue straight on, take the door to her right, or return back through the door behind her. She would pause for a moment to consider her decision. Astrid's 2 strength points were unused (the imp died before they were needed) so are returned to her. 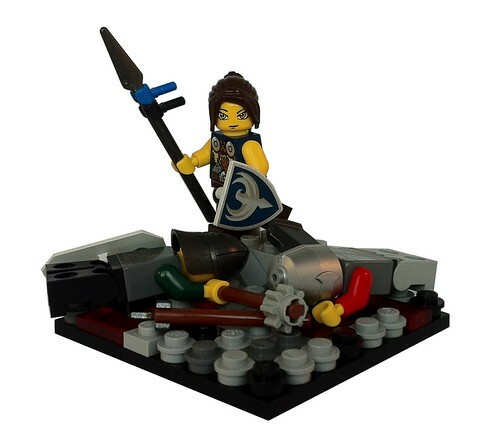 She receives 1 luck point for a successful conflict but no 'gold' as an 8x8 MOC wasn't submitted. 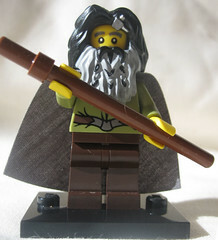 The wizard went through the door to his right, his magically ignited staff in hand. The staff's unnatural glow illuminated the new chamber revealing another three doors, identical to the layout of the chamber he just left. One door straight ahead, one door to his left and the one door he had just entered through. "Infernal trick of a labryinth! I could be walking round in circles?!" the wizard cursed. 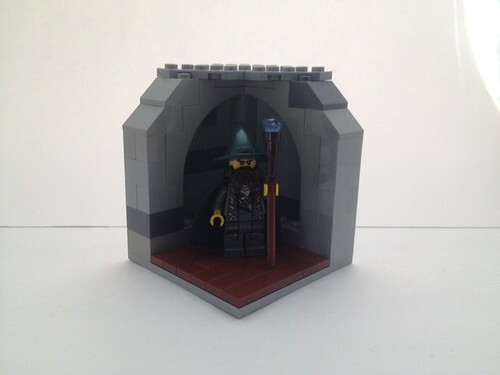 Except this chamber was different to the one he woke up in, becuase in the corner, sharpening his knife sat a fat goblin. The goblin licked his lips. 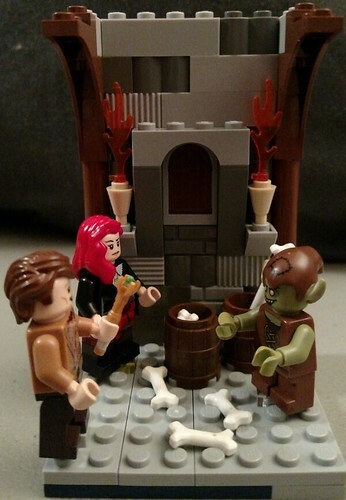 Food was scarce it seemed, and the goblin hadn't tasted wizard blood for a long time. Merc, please submit your points in the forum using a short story. 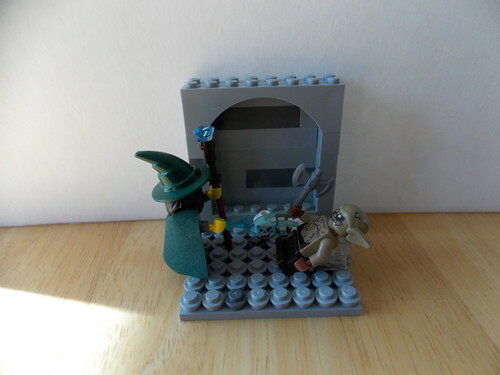 You may also include a small 8x8 MOC of your wizard battling the goblin if you wish. Once you've done this I'll crunch the numbers and write up the result, then move on to the next player. Deadline - Thursday if possible. "Well" said Elias, "I am sorry to disappoint you but I am not going to be lunch any time soon" And with that his hand glowed... and shot out a blue flame. The goblin leapt to one side avoiding the radiant plume of magic and snarled at the wizard, swinging his weapon at the mage (wizard's skill of 4 + dice roll of 2 = 6. goblin's skill 4 + dice roll of 4 = 8... Wizard takes 2 damage!). Elias shrieked as the goblin's blade cut through his cloak grazing his skin. The wizard angrily swung his staff at the goblin (strength of 2 + dice roll of 4 = 6) but narrowly missed as the goblin yet again thrust his blade at the wizard (strength of 2 + dice roll of 5 = 7. Wizard takes 1 damage!). Infuriated by the small goblin, Elias yet again cast a blue flame from his hand (magic of 5 + dice roll of 1 = 6) this time hitting the goblin (magic of 1 + dice roll of 3 = 4. Goblin takes 2 damage). The wizard swung his staff, but the goblin parried and struck the wizard again (wizard skill of 4 + dice roll of 1 = 5. goblin skill of 4 + dice roll of 4 = 8. Wizard takes 3 damage!). In anger the wizard swung again (strength of 2 + dice roll of 4 = 6) but was foiled by the pesky goblin as he ducked and struck Elias with his blade (strength of 2 + dice roll of 5 = 7. Wizard takes 1 damage!). Fed up with the conflict, and beginning to weary from his injuries the wizard summoned a final spell... a cloud of mist surrounded him and the goblin, slowly constricting the goblin's airways... (wizard magic of 5 + dice roll of 6 = 11). The goblin grasped for air as his eyes bulged (goblin magic 1 + dice roll of 4 = 5. Goblin takes 6 damage... dead!) then dropped down dead. The wizard coughed and wheezed as the mist cleared. He had taken a beating, and from a goblin of all things, but he was still alive, and would need to regain his energy to continue his quest. Elias takes 7 damage to his health! 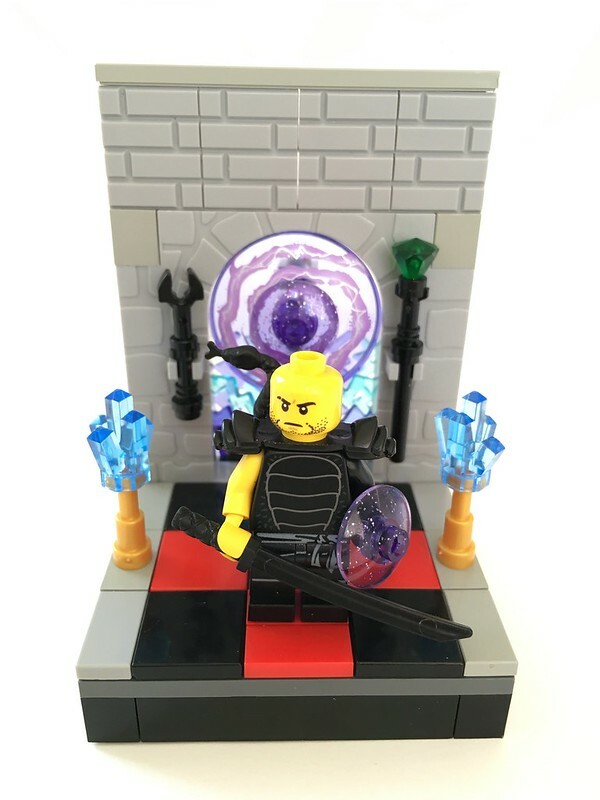 He receives 1 luck point for a successful conflict and 3 'gold' for submitting a 8x8 MOC before the deadline. The warrior silenced the thoughts that invaded his mind, chose left the left door, and went through it. He entered a room not disimilar to the one he had awoken in a short time ago. Three doors, one straight ahead, one to his right and one behind him that he had just passed through. As warrior not unfamiliar with magic, he immediately sensed a dangerous prescence. A force in the room that saught to cause him harm. Out of the shadows, its fangs dripping, its claws scraping on the cold stone floor, its tail lashing from side to side... was a Vilderbeast. Drakk, please submit your points in the forum using a short story. You may also include a small 8x8 MOC of the vilderbeest if you wish. Once you've done this I'll crunch the numbers and write up the result, then move on to the next player. Deadline - Tuesday if possible. The Vilderbeast loomed over the warlock, it many claws crackling with arcane energy. Malekk sensed his foe was no petty threat, and immediately cast a spell. Summoning a swarm of ghostly spiders to envelope the giant beast, he attacked with his dark sword. His "companion" also lashed out, flinging a poisonous barb at the Vilderbeast's face. As the battle commenced, a crazed look entered the warlock's eyes. Kill! Destroy! Using his knowledge of magic, Malekk continued to attack the beast (magic of 6, dice roll of 5 = 11). The Vilderbeast snarled and gnashed his jaws at the warrior, an arcane energy eminating from deep within its core (magic of 4, dice roll of 2 = 6. Vidlderbeast takes 5 damage) but Malekk's enchanment was too strong. Malekk took advantage of his upper hand and swung his blade at the monster (strength of 6 + dice roll of 3 = 9). The vilderbeast clawed and lunged at the warrior in return (strength of 4, dice roll of 3 = 7. Vilderbeast takes 2 damage). The beast was weakening and frustrated that the warrior was escaping its jaws. Malekk skillfully side-stepped the Vilderbeasts attack and struck it again with his sword (skill 3 + dice roll of 4 = 7), the creature screamed in pain, violently whipping its tail around the small room (skill 2 + dice roll of 3 = 5. Vilderbeast takes 2 damage). The beast cried out in pain, it's life energy ebbing away. Malekk's "companion" saw it's opportunity a flung one final poisonous barb at the beast (magic 6 + dice roll 5 = 11). The vilderbeast gave one final scream (magic 4 + dice roll 3 = 7. Vilderbeast takes 4 damage... dead) and slumped to the floor. 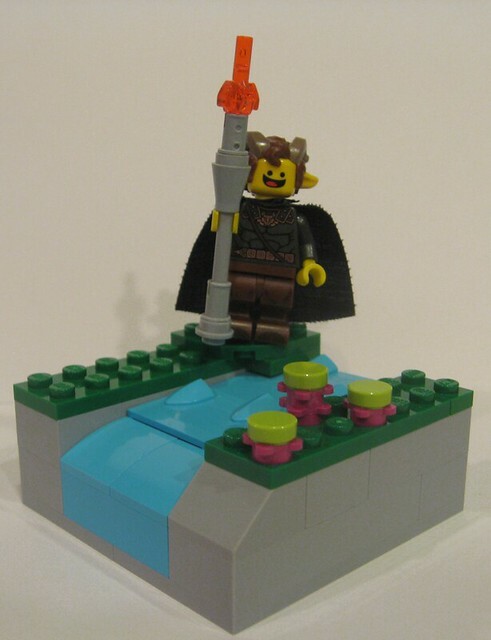 Malekk receives 1 luck point for a successful conflict and 3 'gold' for submitting a 8x8 MOC before the deadline. The faun skipped along and went straight ahead through the central door into the next chamber. It was almost identical to the last with a door to the left, another door straight ahead, a door to his right, and a door behind him that he had just entered through. "Well this a-MAZE-ing..." he said sarcastically, rather pleased with himself at the play on words. Then he noticed something lying on the floor. It's colour was dulled by years of dirt and grime, but its shape was instantly recognisable. It was a key. Fa'ya'yo picked it up. "Intriguing. I guess this might be worth KEY-ping" he said with a chuckle. Apart from the key the room is empty. Fa'ya'yo adds a key to his inventory. 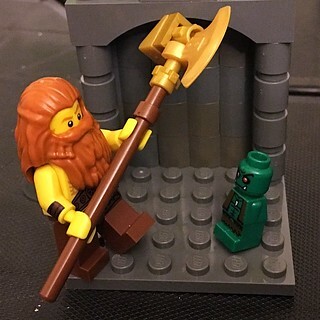 You may build a MOC (in return for 2 gold) to show him keeping the key and I will add it to this post. ... a chamber just like the last. Three doors, one straight ahead, one to the right, and the one they'd just entered through. "Most puzzling" said the doctor "Most puzzling indeed". However, they were not alone in the room. Sat in the shadows, observing them with dark beady eyes was... an imp. 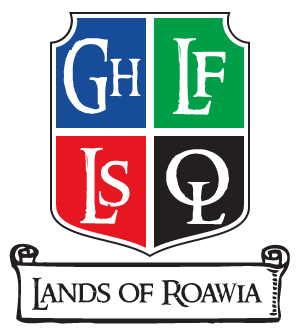 lilcurt, please submit your points in the forum using a short story. 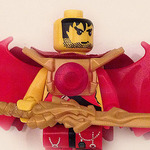 You may also include a small 8x8 MOC of the imp to gain 3 gold. Once you've done this I'll crunch the numbers and write up the result, then move on to the next player. Deadline - Saturday/Sunday if possible. This will also bring us to the end of round one. See the sign-up thread for more details. This is most puzzling said the doctor. A room nearly identical to the last but some how different. He raises his sonic screwdriver and points them at the new doors for a new reading. At the same time as he presses the button his companion shrieks, for out of a dark corner a high pitched scream much like that of a train whistle, blasts... what the devil says the doctor as he jumps and takes a step back. ...The sage attempted to continue his sonic attack on the Imp (Sage skill 3 + dice 3 = 6) but the Imp saw it coming and leaped out of the way of the blast (Imp skill 3 + dice 5 = 8) causing the blast to ricochet off the wall and back onto the sage (sage loses 2 health). The battle continued with the sage aiming sonic blasts at different angles as the imp leaped from corner to corner (sage magic 2 + dice 2 = 6, imp magic 2 + dice 2 = 6. Draw. Sage strength 1 + dice 2 = 3, Imp strength 1 + dice 5 = 6. Sage loses 2 health). "Aha!" said the sage, I see a re-calibration is in order... and he pressed and twist some buttons on his weapon. "Now take that" the sage shouted enthusiastically waving his weapon in the air (Sage skill 3 + dice 2 = 5. Imp skill 3 + dice 1 = 4. Imp loses 1 health). The Imp clawed back launching itself at the sage's face (Sage magic 2 + 2 = 4, Imp magic 2 + dice 4 = 6. Sage loses 2 health). The sage threw the Imp off (Sage strength 1 + dice 3 = 4. Imp strength 1 + dice 2 = 3. Imp loses 1 health). "Hmm, this is a tricky situation" the sage mused to his companion, "but I believe I've been in trickier... I further re-calibration is need...". The sage twisted and pressed his weapon until it began to hum "I suggest you cover your ears...". A high pitched squeal filled the room, as the sonic waves pulsed towards the Imp, followed by a bright flash (sage skill 3 + dice 4 = 7. Imp skill 3 + dice 2 = 5. Imp loses 2 health. Sage magic 2 + dice 4 = 6. Imp magic 2 + dice roll 2 = 4. Imp loses 2 health... Imp is dead). The sage's companion looked at the Imp's lifeless body "Is he dead?". "Most probably..." the Sage replied "but we have further adventures ahead... so onward!" and he headed towards the central door. This ends round 1. See sign-up thread for more details. Edit: Lilcurt also awarded 2 gold for his late MOC.